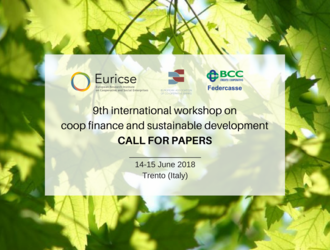 Euricse announces the organization of the 9th International Workshop on Cooperative Finance and Sustainable Development. The workshop is organized in collaboration with Federcasse (Italian Federation of Cooperative Credit Banks) and with the support of EACB (the European Association of Co-operative Banks). They also launched their call for papers. Euricse was founded by the Federazione Trentina delle Cooperative, the University of Trento, Cooperatives Europe, the Province of Trento, and the Foundation Cassa di Risparmio of Trento and Rovereto. It is devoted to the study of co-operatives and social enterprises, along various disciplinary perspectives. Euricse is a centre for analysis and debate with a high scientific profile open to collaboration with the scientific community and, in particular, young researchers. The Institute also interacts directly with cooperatives and social enterprises themselves (see www.euricse.eu).